2 September 1945. 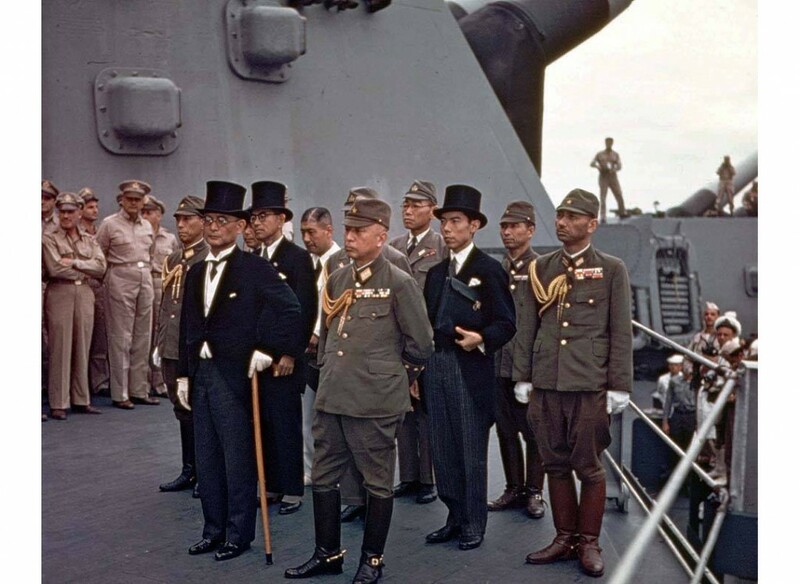 In front of a large group of Allied dignitaries and other officials, the Japanese Instrument of Surrender is signed on the deck of the USSMissouriin Tokyo Bay. On display at the ceremony is the U.S. flag flown by Commodore Perry in 1853, when his fleet entered Tokyo Bay to force Japan to open its ports to the outside world. The ceremony is broadcast around the world. Later that day, the first major contingents of U.S. occupation troops begin disembarking. 2 September 1945. A Presidential Cabinet led by Sukarno is sworn in during the first session of the Indonesian KNIP proto-legislature, which opened on 29 August with Kasman Singodimedjo in the chair. This cabinet will last until mid-November. 2 September 1945. In the wake of the Lao king’s declaration of fealty to France, Prince Phetsarat proposes that King Sisavangvong endorse the unification of the Lao territories. In the eyes of the Lao monarch this move lacks legitimacy because the southern noble house of Na Champasak seeks autonomy rather than integration and Prince Phetsarat’s proposal is above and beyond his station. 2 September 1945. Speaking to a massive crowd in Hanoi’s Botanic Gardens, the Viet Minh leader calls on the Allies to recognize the new Democratic Republic of Vietnam. Even if they don’t, Ho asserts that Vietnam will fight for its freedom. 2 September 1945. In parallel with Ho Chi Minh’s independence declaration in Hanoi, a massive demonstration is staged in Saigon. Local reconciliation is hard ly promoted when ICP and Vanguard Youth leaders exclude Trotskyists and the Hoa Hao Buddhist group from any lead role in the event. The vast demonstration (as many as one million people, it is later claimed) is mostly peaceful but, after shots are fired at the crowd, some violence breaks out against French residents and those perceived to be their associates and collaborators. A French version of events reaches Rangoon, souring British attitudes towards the Viet Minh in advance of Gracey’s departure for Saigon.